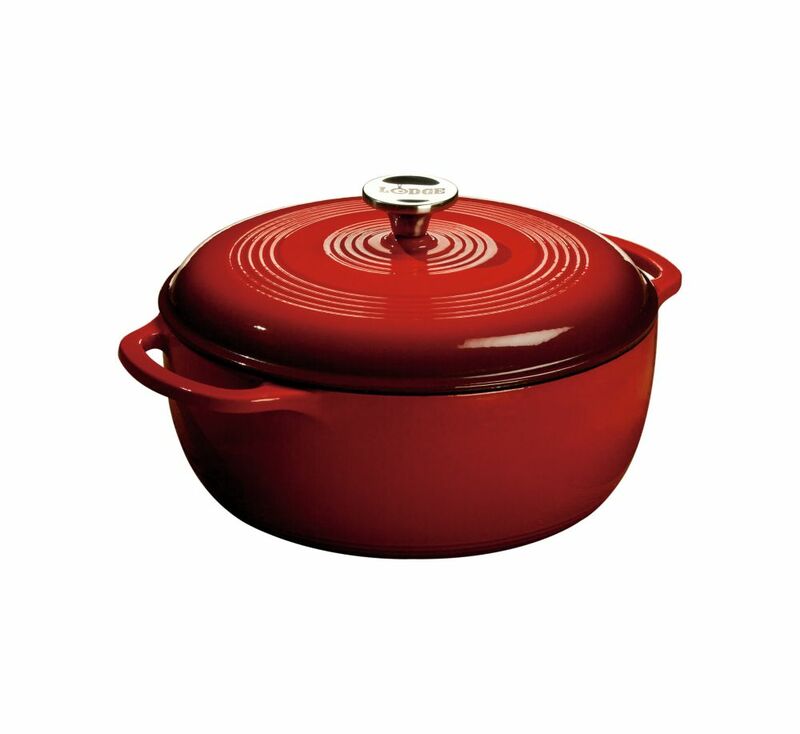 Enamel Dutch Oven, 6Qt, Red Since 1896, the Lodge family has been making cast iron cookware of the highest quality. We always strive to provide an unmatched experience at the greatest value. As times change and techniques evolve, we look to pioneer progress, but always with our roots firmly in place. Lodge's century-old tradition of excellence continues as we marry the benefits of cast iron with the beauty of porcelain enamel. Our enameled cast iron is made to our strict specifications by our partner foundry in China. Enamel Dutch Oven, 6Qt, Red is rated 4.8 out of 5 by 40. Rated 3 out of 5 by James from Because Lodge advertises made in the USA, I was disappointed... Because Lodge advertises made in the USA, I was disappointed to see that the Dutch oven was made in China.I might of thought twice about buying it if I had known that. On the plus side the price was good and it seems well constructed, time will tell. Rated 5 out of 5 by psenjoy from It's very attractive and cooks beautifully. It's very attractive and cooks beautifully. Rated 5 out of 5 by MTcook from The Lodge enamel cast iron dutch oven is great! We have already used it twice, for chili on top ... The Lodge enamel cast iron dutch oven is great! We have already used it twice, for chili on top of the stove and for a beef stew in the oven. The best thing may be the ease of cleanup. I thought I'd have to soak the pot before trying to wash it, but it cleaned up beautifully. Just sorry I waited so long to buy one. Rated 5 out of 5 by Lyn from Makes a perfect Beef Stew in the oven. It... Makes a perfect Beef Stew in the oven. It cleans up as though it was non-stick and it is made in the USA.